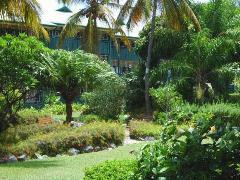 St Croix condo rentals are a great choice in accommodations on the island. You might just find that a condo gives you the best combination of space, value, and usability. And there are lots of excellent condo-resorts on St Croix. St Croix condo rentals are often more spacious than comparable hotel rooms. Vacation condos often provide many of the same services as hotels, including front desk, pools, and help in arranging activities. You'll typically get a well-equipped kitchen, meaning you can enjoy preparing some of your own meals. St Croix condo rentals offer a good variety of configurations, such as different numbers of bedrooms and baths, and different levels of amenities. Generally, condo rentals offer a better sense of privacy and a "home-away-from-home" feel. Note: all rates quoted for St Croix condo rentals are for the high-season. Off-season rates will generally be 60% to 75% of high rates. Remember to add 8% hotel tax and 10% service charge to calculate the actual cost of these St Croix condo rentals. Cane Bay Reef Club is a very popular, small, intimate place on the north coast. It has nine very airy, spacious units right on Cane Bay Beach. Units have living rooms, full kitchens, and balconies overlooking the water. Great sunsets here. There's also a good-sized pool surrounded by greenery and a casual restaurant on-site. Pleasant, casual atmosphere. Excellent snorkeling, too. Located about 25 minutes northwest of Christiansted, just west of Salt River. Rates are $150 to $250 nightly. The Waves at Cane Bay has twelve nice studio units right on Cane Bay Beach on the north coast. Rooms have well-equipped kitchenettes. The units are spacious and nicely decorated, and have private, screened verandas. This place is very kid-friendly, and in general has a very laid-back, intimate atmosphere. The waters of Cane Bay are known for some of the best snorkeling and scuba in the Caribbean, and the staff of The Waves is very diver-friendly. There's also a restaurant here with a great open-air terrace overlooking the water. Rates are $140 to $155 a night. Sugar Beach is on the north coast, just a few minutes west of Christiansted. It features luxury units ranging from studios all the way up to four-bedrooms. All condos are right on the 500 foot white-sand beach. The units are bright and airy, very well-equipped and furnished, with full kitchens and bathrooms and private balconies facing the sea. There's a very nice pool, set right next to the remains of a 300 year old sugar mill. There are also two well-lit tennis courts. Rates range from $188 to $385. They also offer special package deals (golf, scuba, honeymoon, & eco-tourism). Club St. Croix is part of the Antilles Resorts chain. It's just west of Sugar Beach (see above) on the north coast, about a mile and a half west of Christiansted. There are 54 one- and two-bedroom units in a three-story building on a very good beach. Units are very well furnished, with good kitchens and patios or balconies. Nice views of the sea and the evening lights of Christiansted. The resort has a good pool, three tennis courts, and a watersports center. There's also an on-site laundry and a restaurant. Rates are $215 to $285 a night. Colony Cove is just down the beach from Club St. Croix (see above), and is owned by the same company, Antilles Resorts. There are 60 two-bedroom, two-bath luxury suites in a series of three-story buildings. All units face the water or the very lush, manicured gardens, and all are within steps of the beach. Suites have very nice furnishings, private verandas, and very good kitchens. Each unit has its own washer and dryer. Rates are $255 a night. Schooner Bay Condominiums is on the eastern outskirts of Christiansted, overlooking the harbor. It features two- and three-bedroom luxury suites with attractive furnishings, balconies and good kitchens. No beach here, but there are two pools, tennis courts, and a laundry facility. And, it's just a short walk to Christiansted. Units are rented by the week and start at $1150 per week.